From an interesting article from Jarle Aasland on www.nikonweb.com/alanbartlett/, text by Alan Bartlett, who founded Nikon's European digital imaging division in 1988. "Nikon saw itself as a hardware supplier and did not see any reason to extend the Nikon brand into software or services. In 1988, at the MacWorld show, the Nikon team was approached by two brothers who offered them the rights to market an imaging software application. The brothers were Thomas and John Knoll. The application was called Photoshop. [Adobe decided to purchase the license to distribute Photoshop in September 1988. 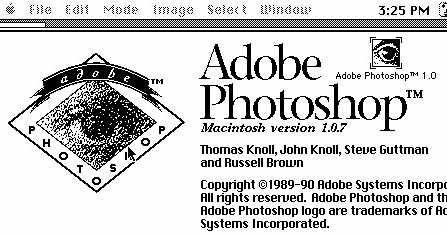 Photoshop 1.0 for Macintosh was released in 1990.]"